Armed with this knowledge, if not this hardware, we can safely say that Williams’ picnic suite appears to be the worse for an encounter with an airborne machine gun. In an English garden. This piece can now be seen in the garage of a semi detached house on the fringes of Luton. 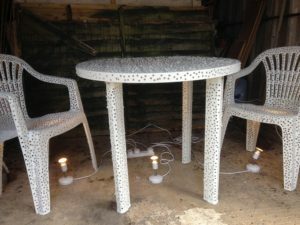 Were it not for the swiss cheese look, this table and chairs would invite you to sit down for a lemonade. But your aspirations have been punctured 1001 times with a drill bit (I would guess 8mm). A pair of cheerful sunseekers here would have been riddled with lead and each sprung a hundred leaks. Such violence is out of proportion to a harmless pretension: the Great British pursuit of fresh air, conspicuous ownership of a small lawn, and proximity to the prize begonias. Or is the strike justified? How many wars have been fought on behalf of people in suburban gardens, who enjoy peace and quiet, even as young combatants fall and families much like theirs become collateral damage? Something about these stackable white chairs enrages artists. In 1990, it was Damien Hirst who called down a plague upon our twee seasonal dining arrangements, and I wrote about it here. Of course, the 90s were innocent times. No one could foresee the creeping outbreak of a long war in which our guns, our planes, and even our sanctions would bring so much death to the Gulf. That said, this mise-en-scène reads like friendly fire, a trigger happy over-reaction by a Spitfire ace. The destruction wrought in Strafed is out of time, out of place, out of hand. You might ask: how could the neighbours have been so unlucky? And you might reflect: I could be next. After all, we are living through the ultimate SNAFU (Situation Normal All Fucked Up). Strafed could be seen in Sunridge Avenue Projects, Luton, as one of 11 works on show in the parental home of artist Dominic from Luton. It runs until June 4, by appointment.